To the lighthouse . . . I don’t stitch and I don’t sew. So what am I doing going to a lecture by Janet Bolton. Before last week I knew very little about her, but a magazine article provided an introduction and made me curious to visit a local exhibition, and then hear her speak about her life and work. I was quite unprepared for the affect this would have on me, and the chain reaction as I found myself looking and thinking differently about textiles and fabric. 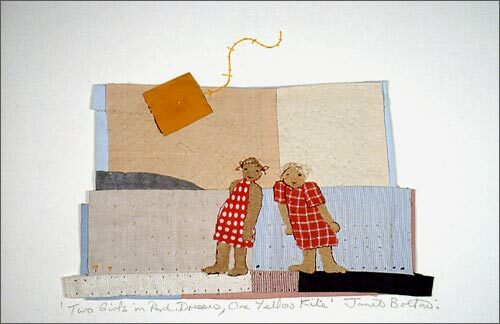 Janet Bolton is in her sixties and for thirty years has sustained a gentle (and international) reputation as a textile artist whose work crosses the boundaries between craft and art. This lady puts pieces of fabric together to create patchwork pictures and assemblages that are unforgettable and play with the imagination like few artists I know can. 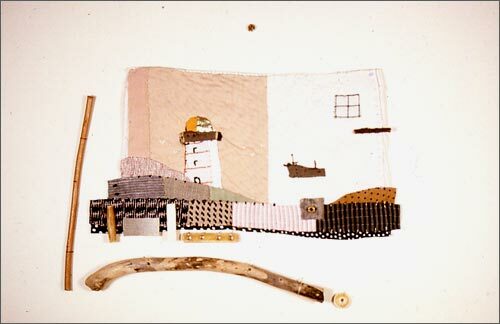 For her the commonplace image – a kite, a lighthouse, a sheep, the button – become symbolic elements that we take into our imaginations. We can all take part in her pictures. What she has done is take the essence of patchwork quilting, and fashion it in a way that puts it in a new and more general context. Quilting, if what little I know of it is correct, has a very long and on-going tradition that seems so bound up with a woman’s world of family and friendship. It has its own aesthetic and ethnography. I dipped into Cheryl Torsley and Judy Elsey’s book Quilt Culture and was taken aback by the way this activity of both personal and communal design and craft had seasoned literature (such as Toni Morrison’s Beloved) and fine art (Robert Rauschenberg’s Bed) Here’s an abstract from an academic journal article titled Quilt Language: towards a poetics of quilting. The aesthetics of quilt making can be defined by exploring three ways in which quilts speak: through their formal qualities, their use of fabric, and their social context. The discussion here is focused primarily on nineteenth-century America, where quilts were important historical documents that transmitted information about women and their lives that might not have been available through other means and that otherwise may well have been overlooked. Quilts speak through their ‘graphic wit’, their use of formal elements, and their makers were adept at manipulating shapes, colors, and patterns to achieve dazzling visual displays. Fabric was also an essential element through which quilt makers expressed themselves. As well as providing the basic ‘palette’ of a quilt, the fabric was significant in its own right, whether it was purchased new or it was recycled for its emotional resonance. Additionally, although women made quilts, their significance often transcended the domestic realm. 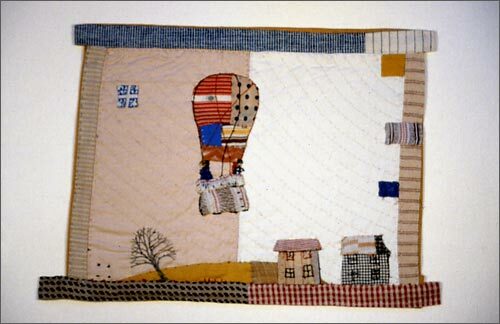 Finally, women used their quilts as a way of making utterances: whether to tell stories about the Bible, to collect images related to their lives, or to connect to other people, living or dead. 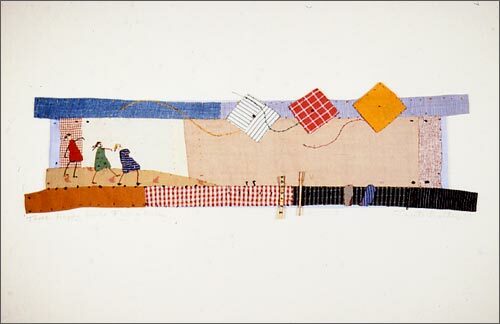 The quilt aesthetic is still a thriving tradition and the transformative potential of using fragments to piece together a whole is especially relevant today. Strong stuff, and a perhaps a world away from Janet Bolton, who, by her own admission seems surprised at the reaction her gentle ‘home-made’ work has drawn – from serious galleries and art critics as well as enthusiastic quilters and craftswomen (who speak with such joy and enthusiasm about her workshops). Here’s a great example I discovered, a blog I thought quite delightful and life-affirming. The ingredients that seem to have made Bolton’s work so popular, accessible and truly unique are size, simplicity, care about complexity of content, and irregularity of fabric structuring matched with precision of stitch. Very little is made that is larger than 30cm by 30cm, and generally much small (you can’t put these patchwork ‘quilts’ on anything but a very small cot!). The scale just seems to suit the amount and nature of content. The fabric is varied, and is often surprising – but is never crowded. You’ll see a cotton remnant next door to a piece of fine Japanese silk . . . and it works. The colour tones can be close – they can be way apart. And the content – well this is the masterstroke – the content is what belongs to us all, what we all recognize, and what so often pulls the heartstrings of memory, even memories we don’t actually own to ourselves, but ones we have read about, seen on TV perhaps. My wife said when she looked at Janet’s pictures: ‘they have the same magic as the books (and illustrations) of Shirley Hughes’. Let me tell you about one image Janet showed in a really excellent sequence of slides in her lecture. Here were four girls in cotton frocks. They were standing as young girls do with legs and arms all over the place, no sense of balance and deportment here (sorry – but I couldn’t find the image anywhere on the web). This is what you recognize from holiday photos – sisters and cousins on the beach leaning on one another. You imagine big smiles, noisy voices, ice cream, sunny days, the sound of the sea, picnics . . . get the idea? In Janet’s work this is the stuff that floats across your inner eye as you gaze at this ‘simple’ assemblage of fabric, fabric that speaks about the perennial pleasures of life: a sheep in a field, a balloon in the sky, kites flying, collections of trinkets on a dressing table, a vase of flowers at a window. Why, why is this all so meaningful, always so meaningful it can make you cry with longing, laugh with joy? If I knew the answer I would be a much wiser person than I try to be . . .
Janet’s website is a model of simplicity and has a good selection of images. It’s worth a look. That said, there are themes and instances of design and content that are missing. So although I’ve illustrated this text with some of her work I have decided to include a few of my own sketches made during the lecture to amplify things I liked and noticed. The most striking omission from anything I could find on the web was her fascination with H shaped images and what she called ‘arrangements and assemblages’. So I include both in my two sketches. I think they speak for themselves. The day after Janet’s lecture I found myself thinking very hard about what I’d seen and heard in the context of my own making. 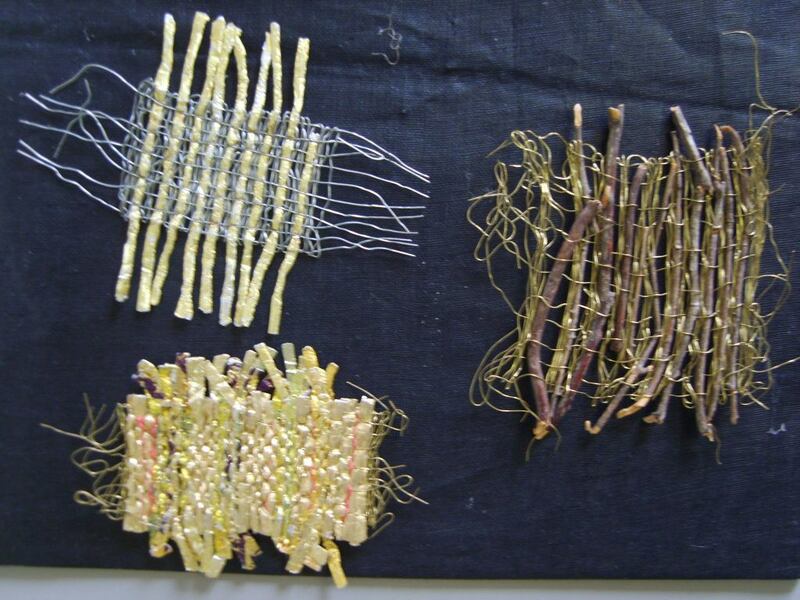 Was there something within woven textile design I could weave into my own work? Are colours and patterns of weave themselves meaningful, or could one find a way of bringing such direct images and forms into woven structures through hand-manipulation of some form? I know people do this – think of those pictures and patterns created using pick-up sticks in double weave – but I really dislike most of it! As I considered this I came across in my Sunday paper an article on painting by Fiona Rae. She is an artist who says ‘I feed an image into Photoshop and flip the colours around. Then I paint it for real’. 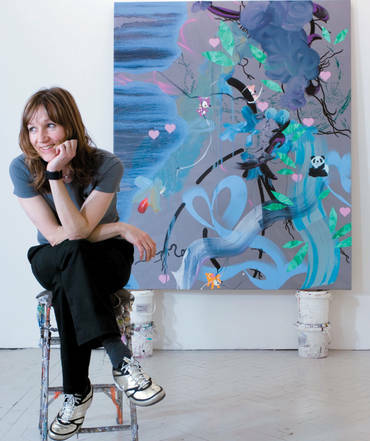 She doesn’t draw from nature – she likes her images mediated through culture. ‘So while Mickey Mouse is a huge inspiration, a real mouse isn’t’. Her source images are little blobby angels, hearts, pandas . . . get it? This is Janet Burton territory with a post-modern slant . . . and it works. Fiona Rae is a graphic designer’s dream. She uses paint like it was produced on Photoshop. Her colours and textures are so wide-ranging but put next to each other in such a clean cut way, and her style so print-perfect you could see a designer making them. But it wouldn’t be half as good, because it wouldn’t be painted by hand. And it is the extra dimension of texture, and the possibility of human error, that makes the difference. For instance the marbled effect she creates as an under layer to some of the paintings. This is a purely random out come you could only create with a human and a brush. 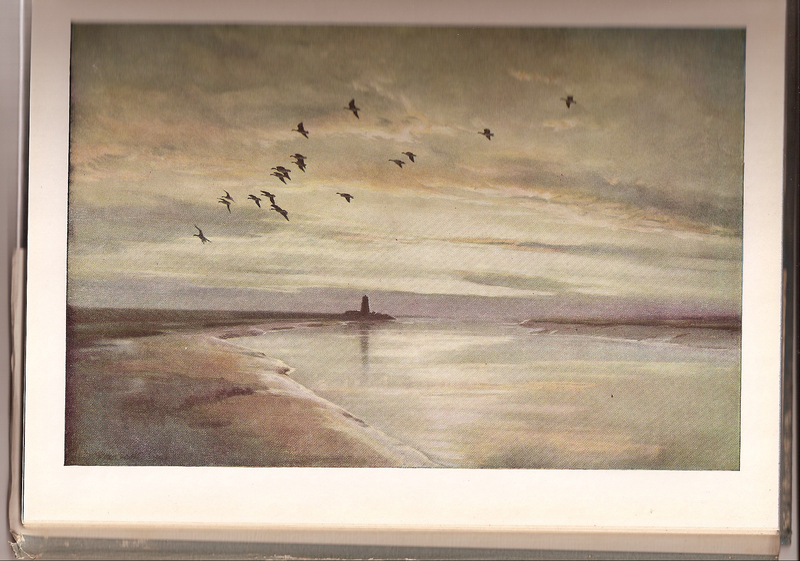 My final encounter with those images and symbols we all recognize can feed our imagination came through the post this week – a copy of Paul Gallico’s The Snow Goose, a (rather battered) edition from 1946 with paintings by the ornithologist Peter Scott. I’ve acquired this book because my treasured copy has disappeared and I want to share this affecting book with a friend to whom I have just lent William Fiennes’ The Snow Geese, a recent book about migration, home-sickness and a journey of recovery after illness (and, incidentally, snow geese). I remember exactly when I read and fell in love with Gallico’s novella. I was eleven years old and sitting in my school library. It was snowing and there was ‘no games’ that day, just a well-banked up library fire to sit beside. Then, I had never experienced the Essex marshes. I think I’d read about Dunkirk, but never sailed a boat, and had no idea about landscape or portrait painting. As for snow geese . . . but there was something in the images that book brought together in my head (it wasn’t the illustrated edition) that must have been somewhere in my genes. Since then my relationship with that book has been informed by all the things I didn’t then know and possibly my love for North Norfolk (listen to my Spring Manoeuvres radiophonic documentary), landscape painting, sailing and the rest has been amplified by this (very sentimental – but wonderful) book. On the loom I’ve just retied the double weave warp I created for my final college first year project in mid July. 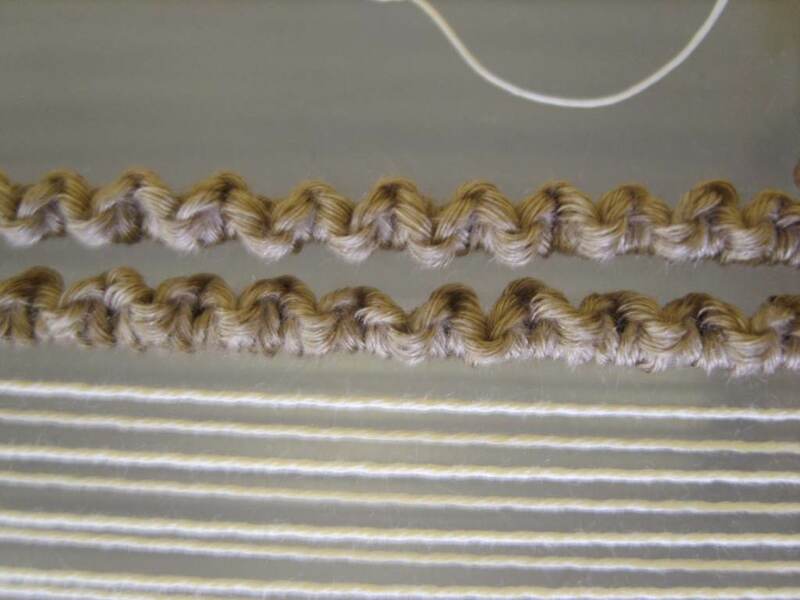 I’m planning to weave a piece that opens out to double the width, something I tried to do with my last swatch for my college project (but failed – a few mistakes made it impossible). I’ll do it this time. I’ve been planning, carefully, a method of making this work for me. It is probably a little unorthodox, but it’s worth a try. I still love the colours (from my study of sea and sky back in June) and the warp seems as beguiling as it was 2 months ago. It’s going to be a present for my mother in law Margaret. A very late 80th birthday present. Participants will need: Strong wooden frame (ideally not smaller than 60 x 30 cm), scissors, bobbins/fork, 6” ruler, notebook. Warp of choice (variety of thicknesses useful) e.g. cotton seine twine. 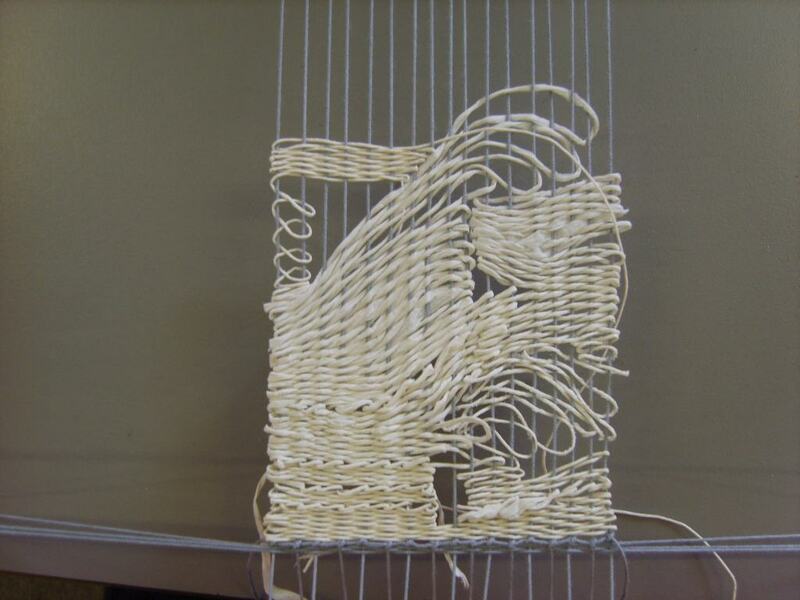 Weft threads of choice (if not sure, bring options) e.g. 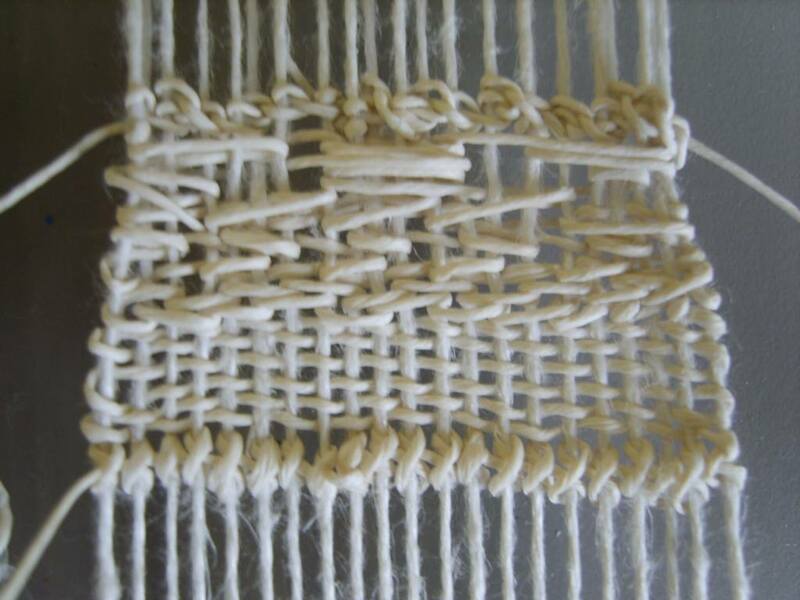 linen, cotton, other twines, raphia, paper, thin wire etc. Sewing needles/cotton. 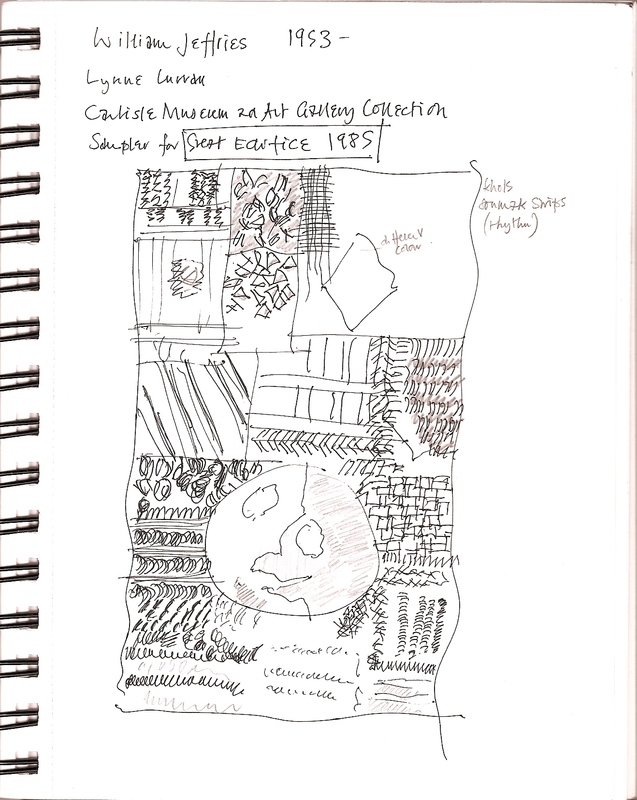 Last weekend I attended the second of two workshops given by tapestry artist Sue Lawty at Bankfield Museum in Halifax. The workshop title (above) summoned a group of 10 textile enthusiasts of varying experience and ability to ‘explore the structure, rhythm, scale, light and shade of a selected yarn’ . . . and we certainly did! I’ve written about Sue Lawty in two previous blogs so I’m not going to dwell too much on how this charismatic and generous artist manages to create such a sense of purpose amongst her workshop students. What I do want to describe here are aspects of the workshop itself: what we did and what the outcomes were. In the gallery below there are images I have collected of some of the work produced. For some these might seem a little inconsequential, but the effect of engaging in often quite small-scale activities, and what these may trigger or develop into in the future, could be useful and significant in the longterm. You’ll see from the opening paragraph we all received from Sue a list of items necessary for us to work with. 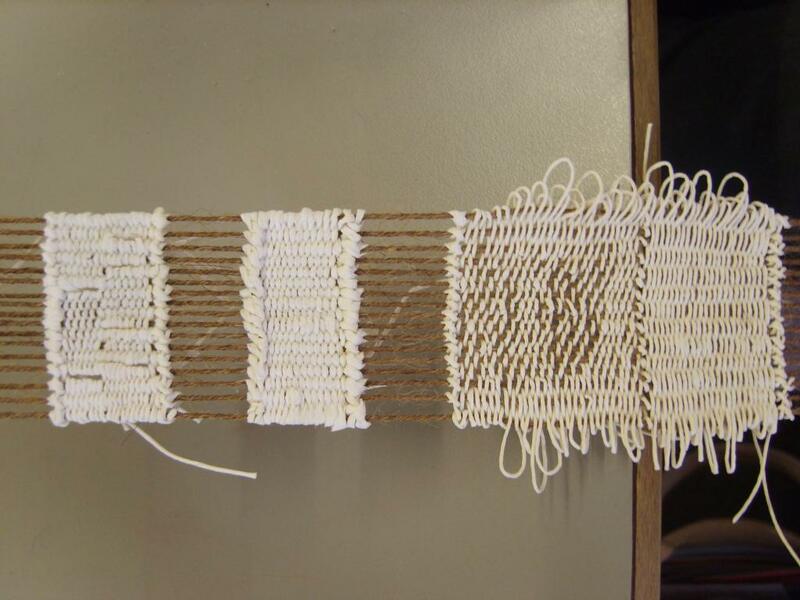 During a brief introduction Sue suggested we might all work with the same material as weft – a paper yarn (about 10 epi). 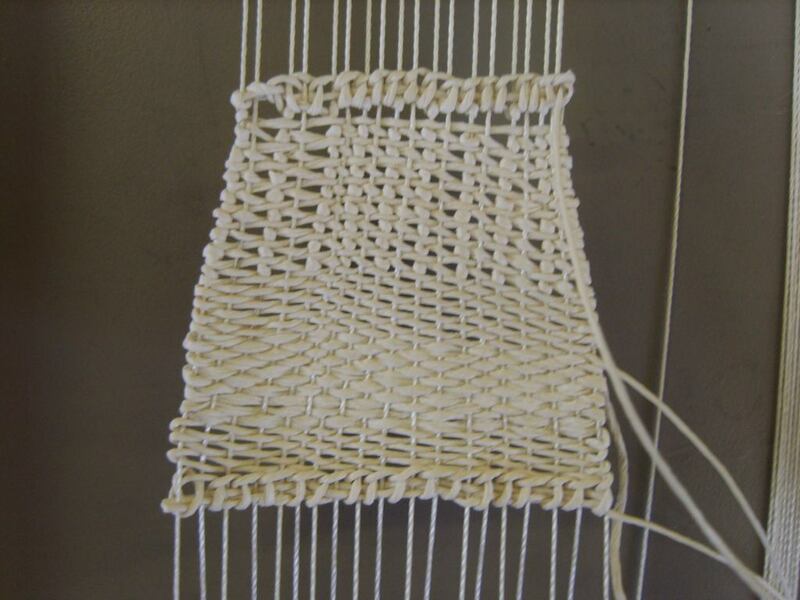 We were encouraged to make very small warps on our frames and explore freely how this rather difficult and sometimes intractable material might be worked. We were being limited as much as possible – using one material and one material only – and through such limitations encouraged to build a vigorous and knowledgeable relationship with the yarn. We were shown how the put a warp on the frame using two different approaches. The first was the traditional ‘wrap around’ technique. 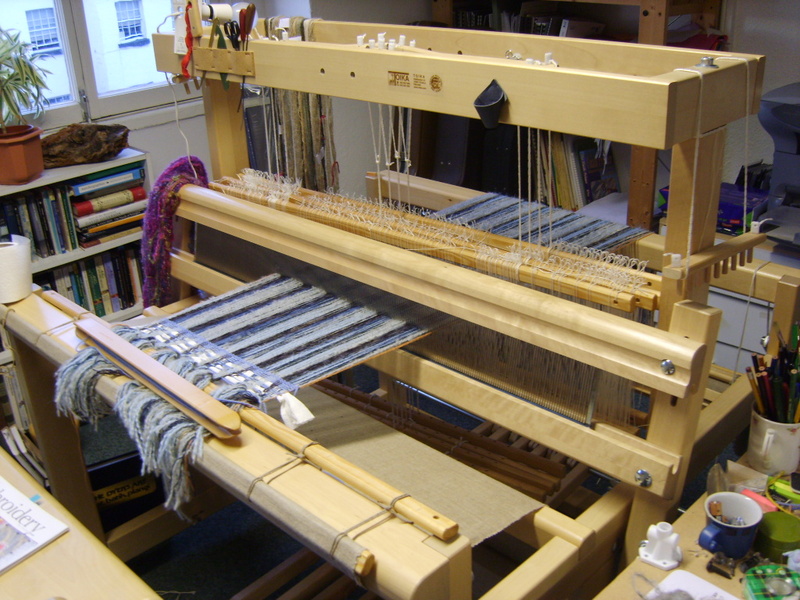 Sue demonstrated a good way of keeping the tension on the warp by revolving the frame around the warp yarn rather than wrapping the yarn around a stationary frame. 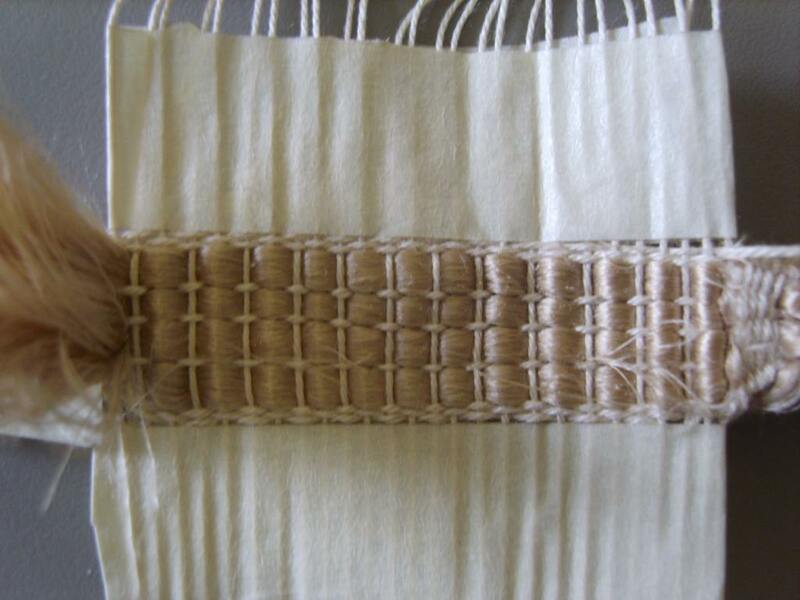 The other technique introduced the idea of cutting warp threads to a double length and creating a warp from tying larks’ head knots on one end and tying the other end with the kind of square knot I already use for tying a warp to the front beam in handloom weaving. Keeping an even tension was stressed as so important – and I learnt a necessary lesson here in my failure to achieve this. 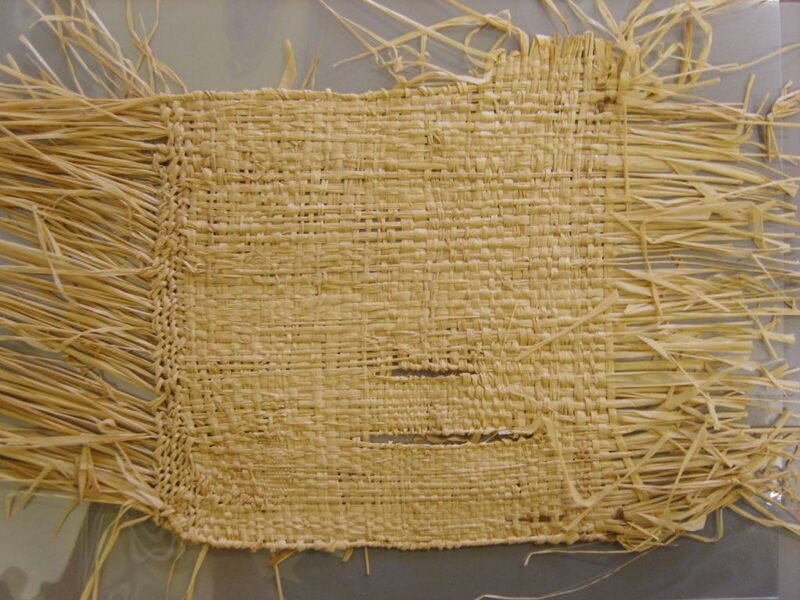 From then on the most necessary tapestry weaving techniques were quietly introduced – those of us who were uncertain about these were gently and individually helped (without disturbing or frustrating the progress of the more experienced and able weavers). Those all important edge knots I finally mastered using Sue’s analogy with letters – C one way, D the other – brilliant! 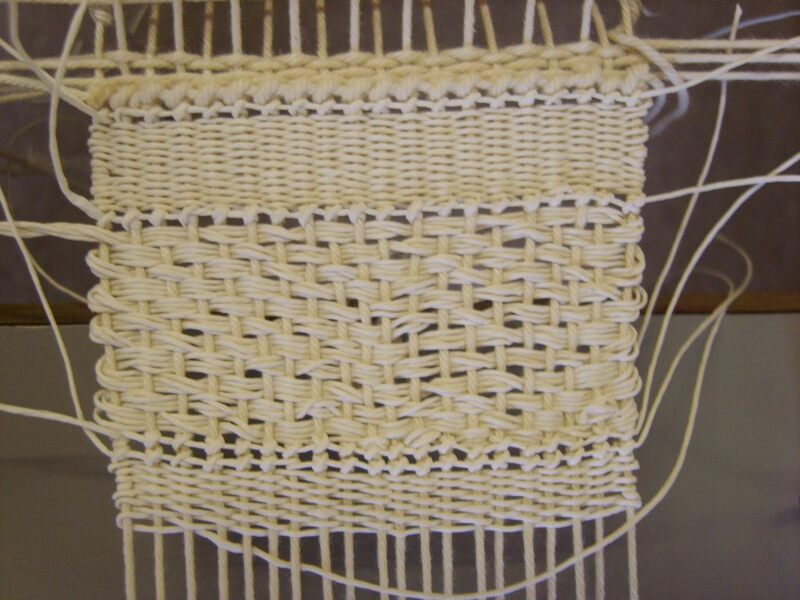 And then plain weave itself – just so many, many different ways this can be approached and executed. 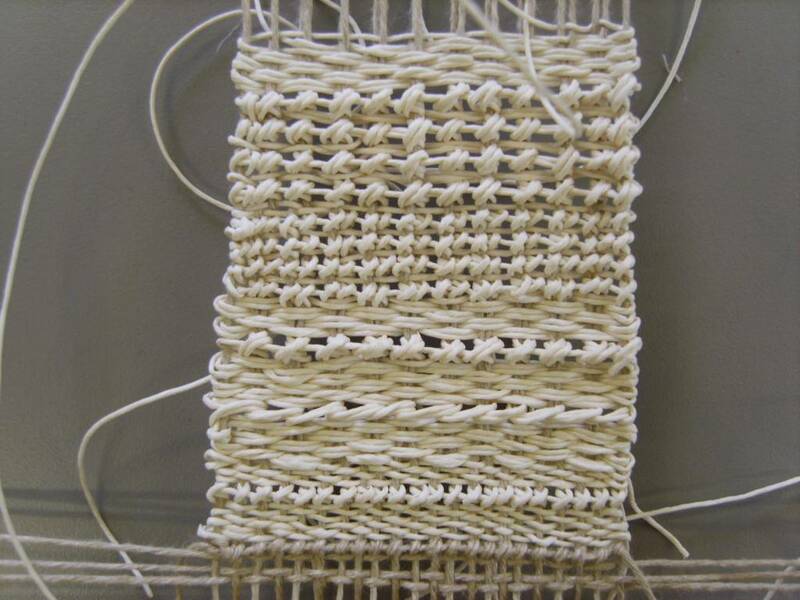 We were encouraged to think about assembling a kind of dictionary of examples, woven ‘characters’ we knew intimately and that might become part of our own personal language state for weaving. From this dictionary we could then fashioned words, phrases, sentences and paragraphs in different scales and rhythms. 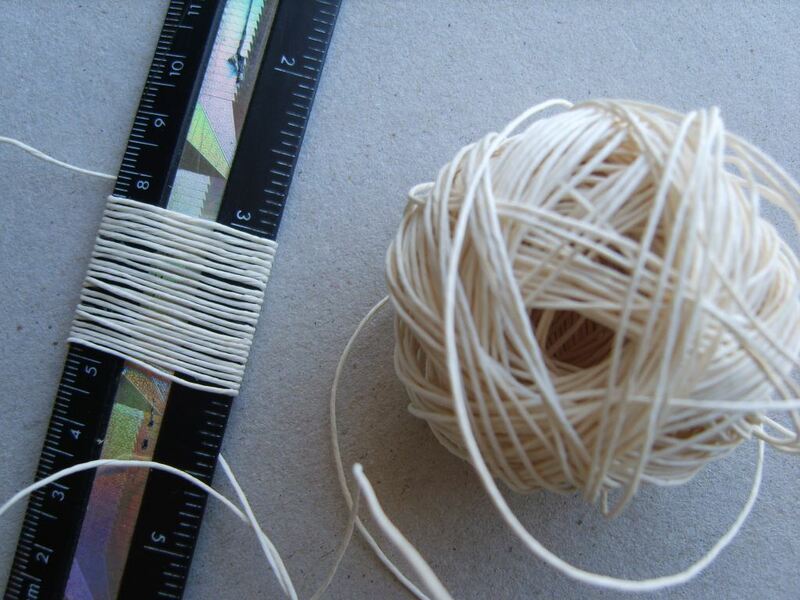 I think we were all surprised, amazed, and taken aback by turn at the outcomes such careful execution, sampling and research into the way the paper yarn could be handled. The results of the whole group, even after a couple of hours were so various and most inspiring (look in the gallery at the bottom of the page for a selection). Sue placed a series of craft tables end to end along the length of the room and had us place our frames in a row. 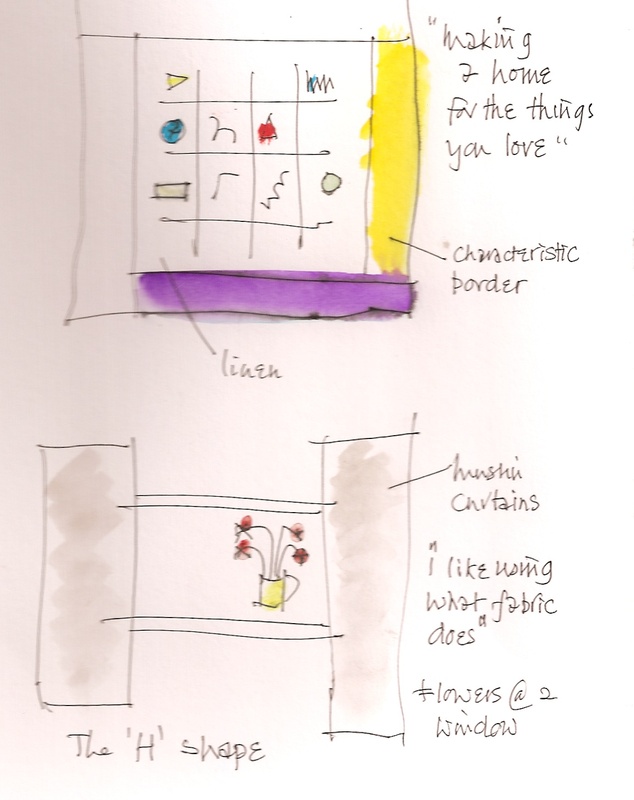 She then discussed each, not critically, but making a description of each experiment from which she then applied her own artistic response –’ I would do this, then this and I’d then try this, and did you know that paper yarn takes dye and colour really well . . . ‘ a constant flow of artistic possibility and imagination. Her words became for me a kind of litany of action: try not to do something you already know; create a dialogue between you and the thread. From time to time Sue would bring us together, often as a result of a question from or a dialogue developing with an individual. She showed us, for example, a turning point in her own work – from some twenty years ago following her first visit to Australia. 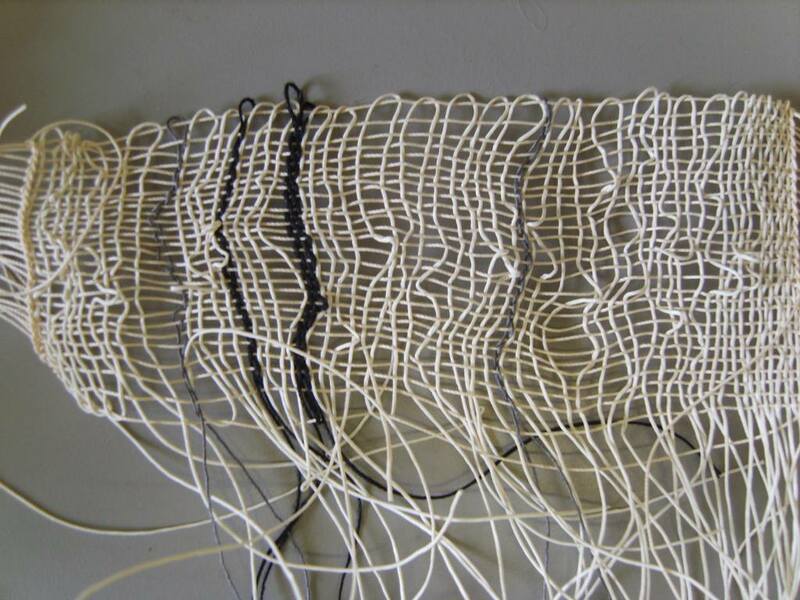 She developed a piece using raphia, a material rich in both limitations and possibilities. What was fascinating here was the unstable grain and colour of the plain weave surface and the sequence of steps Sue began to take to explore the surface texture and structure. As I already know her work using hemp (another difficult / unusual material) specially commissioned for Bankfield (and discussed in my blog on her previous workshop), so much of what was shown in these small-scale examples I could appreciate as the building blocks of technique, material knowledge and practice shown in work produced quite recently. 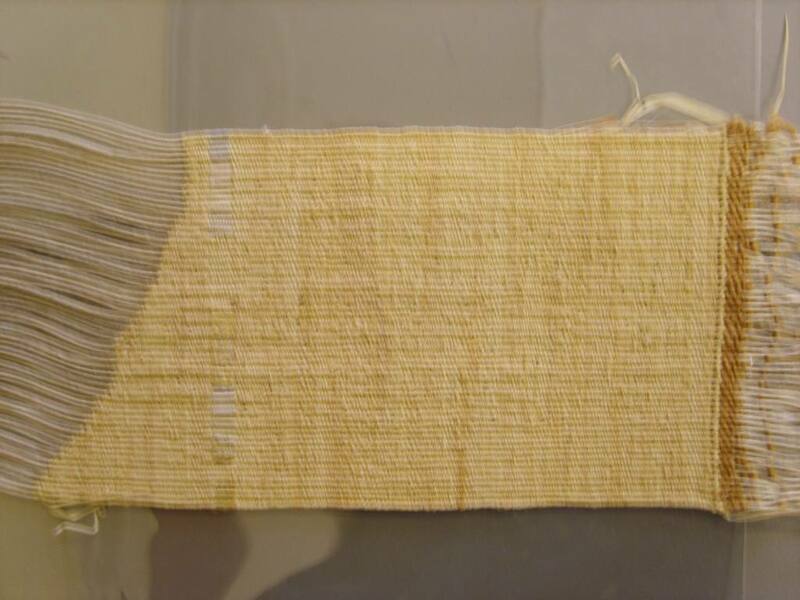 Another aspect of Sue Lawty’s approach to developing a personal language was the close study of existing forms, often from outside the usual field of reference for a tapestry weaver. She particularly acknowledged the influence of basket making and had available on her ‘book table’ a fascinating volume on Contemporary International Basket Making by Mary Butcher (newly appointed artist in residence at the V & A). Sue made a special point of using books she had brought with her to illustrate and discuss ideas and examples both with the group and individuals. With me, she mentioned the practice of weaver William Jefferies, a name I’d just come across with reference to a blog I’d discovered by Steve Bremner. On the table she had a short monograph about Jefferies with a great illustration of his abstract work making use of what Sue described as rhythms of knotting. I intend to find out much more about Jefferies, though there currently seems little in print and on the web. All in all there was so much to take in from what amounted to a very informal style of workshop guidance. If you were alert you could find yourself picking up nuggets of information and guidance being spread informally around the workshop space. Sue was always ready to answer the most mundane and seemingly simple questions. I asked just how she made joins between separate lengths of weft yarn. The answers I got were rich and various, often the result of much trial and experiment over the years – and Sue made one feel that such questions were important and necessary – and that she had asked them and in some cases was still asking them. It was clear her technique never stood still. There was always a different way in a different context, with invariably a different material. From discovering Craftspace I was led to the work and blog of curator and maker Helen Carnac who has been the driving force behind Taking Time. Her blog documents how such an exhibition is being assembled and provides valuable links to a whole community of people related to craft, design and making that (with two exceptions) I had never heard of. Slow Making is relationship and action’. The figure of Richard Sennett, whose book The Craftsman I’ve probably mentioned in these pages, is a central one in relating craft and making to the Slow Movement. Much of the current rationale and ammunition for practising slowness comes from this very readable book by this professor of economics from the LSE. There are, I gather, two more volumes in the pipeline. 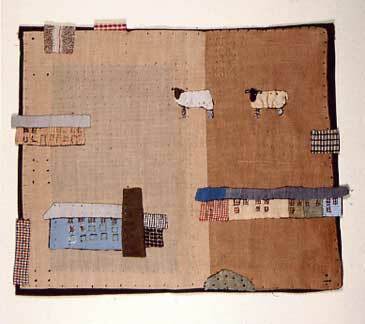 Finally, here are a few words about textile artist Matthew Harris. Investigating links between music and textiles in the course of promoting my Textiles and Music Interact! project completed last month, I discovered a collaboration between jazz musician Keith Tippett and this textile artist from Gloucester (who I then discover is one of those showing in Taking Time). I wrote to Matthew about my project’s work and he most kindly responded with some fascinating illustrations and writing about his music-related work. 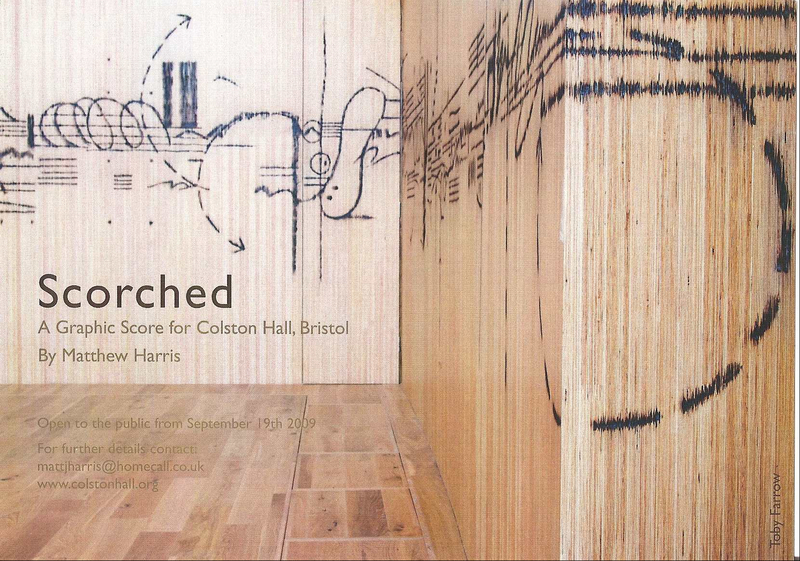 He’s currently involved with Michael Brennand-Wood in the refurbishment of Bristol’s Colston Hall and has taken inspiration from the graphic musical notations used by composers such a Karlheinz Stockhausen. In an essay on Harris’ catalogue Trace Elements (University of Gloucsetershire 2008) Brennand-Wood writes: ‘Both Music and Textiles rely on sensory engagement to access content. They are so clearly constructed, orchestrated, scored and designed; yet initial response is often a primal reaction to colour, texture, iconography, sound and rhythm’. There’s a profile article on Matthew by Ian Wilson in the May / June issue of Embroidery.